Mo’s has been a part of Berliner Kreuzbergian life for much longer than I have lived here. 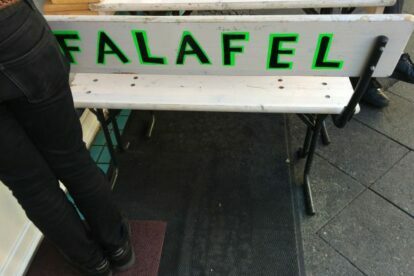 And even though I agree it is royalty in the world of falafel, to me it will always be the Queen, as it is always the gentle lady, that prepares my luscious falafel im brot. For years I was even lucky enough to live above the little hole in the wall it inhabited in Graefe Strasse. Unfortunately, as gentrification crawled in and prices went up in Kreuzberg, the little Imbiss was forced to move. Mo’s is now located in Urban Strasse, kind of an uneventful part of Kreuzberg. And yet, you’ll more than likely find a queue when you go there; even in winter. There are very few other places that will even come close to the delectable experience that it is to eat there. There is not much seating space and it is all outside so it is more of a stop and go. But, trust me, it’s well worth it. Now, eight years after my arrival in Berlin, having also left Graefe Kiez, to me it is still the best falafel in town, with rich, moist falafel, seasonal veggies, hummus or nut paste if you choose, topped off with a bit of yoghurt. There are many variations: vegan or with cheese. Just have a look at the handwritten menu. Then, indulge. I promise the way you look at falafel will never be the same.